I am sure there are lots of ways to make this curry but I haven’t found any Vegetarian versions. 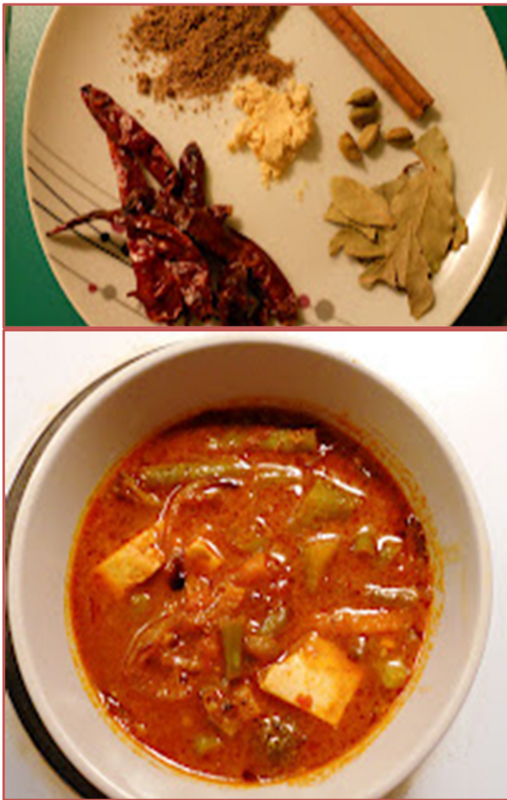 It is important that you have all these ingredients especially asafoetida and mustard to get the real flavour. So here it is straight form Nev’s Veg Kitchen...Vegetarian Rogan Josh Curry. In a large pot heat the oil on medium heat. Add mustard powder to the oil and mix well. Add asafoetida continue heating the oil. Next add the whole spices, cardamom, cinnamon, bay leaves and cloves. Fry them well in the oil. Add the fennel powder and cook it for a few minutes. Next add the sliced onions and fry till they are golden brown. You will be hit with a heady aroma of all the spices. Add the ginger & garlic paste now and cook well. Mix in the whisked yoghurt. Next add the chopped pureed tomatoes, cook till oil separates from the sides. I sometimes add vegetable stock to the spice and onion mixture, but you can use plain water. Add water to help everything cook together; adjust consistency as per your liking. Now add the chilli paste or if using powder add a few drops of water to the powder before adding it to the mixture. This will bring out the hot red colour in the gravy. Next add the Paneer pieces. If using veggies add those at this stage and cook covered for at least 8-10mins. Keep stirring in between and adjust any seasoning at this stage. Turn off heat. Let it rest for some time.Squeeze some lemon juice before serving. This is something I like but you can skip this step. Serve with boiled rice, garlic naan or roti. It tastes better the next day so if you are making it for a party I recommend cooking it the night before. Serve with nice and crisp pappadums and some sliced onion sprinkled with lemon.